Rupert Grint, F. Murray Abraham, Stockard Channing and Nathan Lane in a scene from "It's Only a Play." Photos by Joan Marcus. INSIDERISH plays can be problematic for the theatergoer, who is, after all, outside the business. However, in our celebrity- and Social Media-centric culture so much is more relatable than ever. 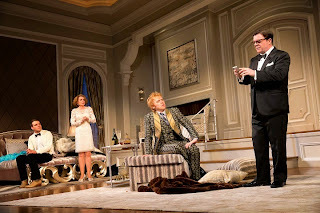 "It's Only a Play," at the Gerald Schoenfeld Theatre through 4 Jan. 2015, has enough transparent references to be accessible to most. Helping us navigate the theatrical allusions, Terrence McNally has retuned his 1987 comedy to bring it up to date. Assembling at producer Julia Budder’s (Megan Mullally) lavish home (sets by Scott Pask) are many off-stage A-listers breathlessly introduced by Gus P. Head (Micah Stock), the coat-check jockey. Pacing nervously in Julia’s boudoir is James Wicker (Nathan Lane), a TV star on the verge of falling off his perch. James is in town to witness and support his best friend, Peter Austin (Matthew Broderick), on the opening night of his Broadway debut play. James’ sitcom, “Out On A Limb,” kept him from taking the lead in Peter’s production. Virginia Noyes (Stockard Channing), a bad-girl former movie star, hopes Peter’s play will be her ticket to redemption. Rehab certainly hasn’t helped. Rounding out the cast is the whiz-kid English director, Sir Frank Finger (Rupert Grint), and the nasty critic, Ira Drew (F. Murray Abraham). Everyone at the soiree is in glamorous gala dress (courtesy of “It's Only a Play” costume designer Ann Roth). TMcN provides zippy lines that skewer anyone involved in showbiz – from actors, critics, hangers-on, to audiences. Even ushers are not entirely exempt. Jack O’Brien’s direction keeps the pace of the piece racing along. 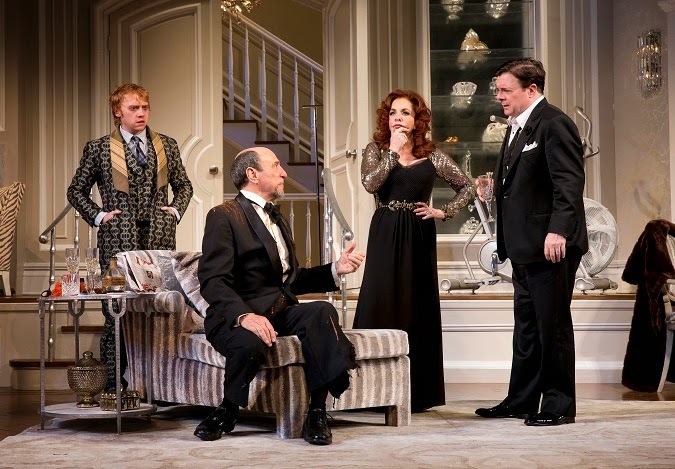 Micah Stock, Megan Mullally, Rupert Grint and Nathan Lane are show business types in "It's Only a Play." Among the standouts in this stellar “It's Only a Play” cast, in order of magnitude, is NL. He has no peer on this stage. Front and center for the entire play, he is just tops. FMA fulfills the promises of his small role. Julia, in MM's hands, is a completely lovely ditz. SC is superb as the naughty Virginia.